It is said let no one judge another. If we can find the time to love as Jesus did, we would be more happy with ourselves. I AM an ally, because I truly understand that people are of God. Ellison Bennett is a native of Pensacola and graduate of Booker T. Washington High School, noted as the historical Black high school in Pensacola. He grew up during segregation and understands the pain of discrimination and bigotry first-hand. Ellison has championed social justice issues most of his life and credits God with his unwavering commitment to equality for ALL people. He served as president of the Pensacola Chapter the SCLC (Southern Christian Leadership Conference) from 1998-2004. Ellison has served in various capacities within the community including as a volunteer for the Southern Poverty Law Center, mentor with Warrington Middle School, board member with The National Movement for Civil and Human Rights, Inc., board of directors with S.L. Jones Christian Academy; feeding the homeless, and Hurricanes Ivan and Katrina efforts. The very beginnings of the SCLC can be traced back to the Montgomery Bus Boycott, which began on December 5, 1955 after Rosa Parks was arrested for refusing to give up her seat to a white man on the bus. The boycott lasted for 381 days and ended on December 21, 1956, with the desegregation of the Montgomery bus system. The boycott was carried out by the newly established Montgomery Improvement Association (MIA). Martin Luther King, Jr. served as President and Ralph David Abernathy served as Program Director. It was one of history’s most dramatic and massive nonviolent protests, stunning the nation and the world. The boycott was also a signal to Black America to begin a new phase of the long struggle, a phase that came to be known as the modern civil rights movement. The SCLC is a now a nationwide organization made up of chapters and affiliates with programs that affect the lives of all Americans: north, south, east and west. Its sphere of influence and interests has become international in scope because the human rights movement transcends national boundaries. Ellison is a Vietnam War veteran serving from 1970 – 1975. He served as a police officer in the early 1970’s and graduated from Mortuary School in Miami Dade in 1977. He was the first Black letter carrier in Haines City, Florida, and received death threats daily because of his race. From 1984-1987, Ellison served as a member of the Haines City Council. He established Pensacola Caskets in 2014 and continues this efforts as a tireless servant leader. Among the many honors and awards Ellison has received are: 1986 Haines City, FL Dr. Martin Luther King, Jr. award and the 2004 Vietnam Vet Rev. H. K. Matthews award. 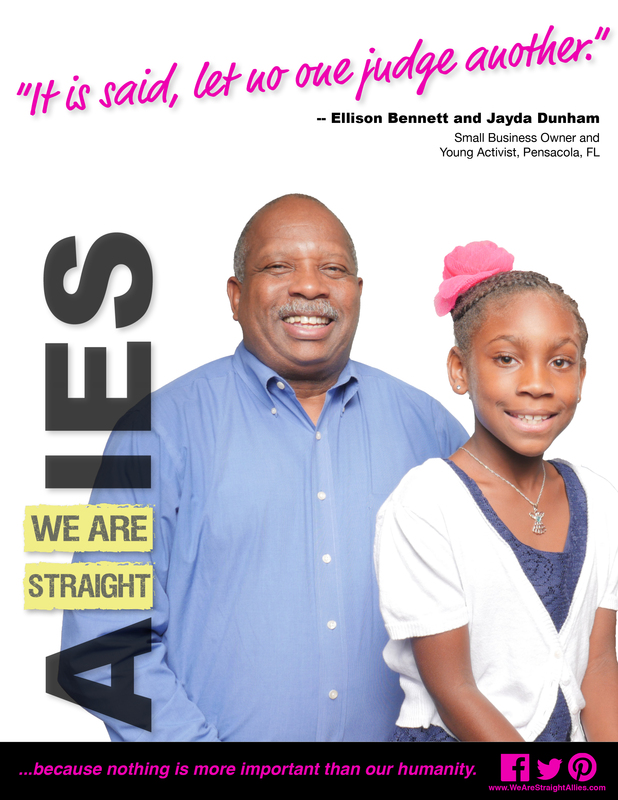 Ellison met Jayda Dunham (age 8) while working on equality efforts with her family in Pensacola. We profiled Jayda and her mothers back in October. Her mothers have instilled in Jayda that, despite the world’s differences, all lives are important and matter. As a seasoned advocate, he mentors a new guard of community activists championing for the equal treatment of all people.